Shop from now until August 20, 2017 at U.S. LOFT Outlet Stores and get discount on your purchase. Take an extra 10% off your entire purchase. To receive the offer show the coupon at cash desk. 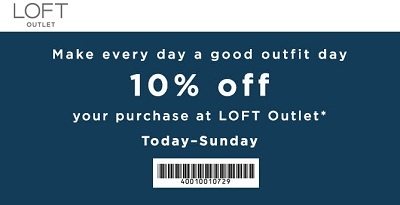 For more details visit any U.S. LOFT Outlet Store or U.S. LOFT official website.